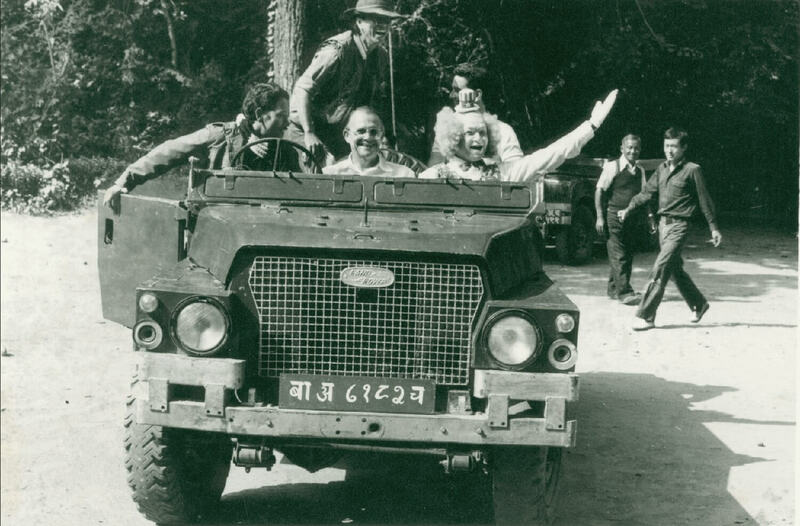 Nepal’s early naturalists in Chitwan guided celebrities like Beatle Ringo Starr (in Dhaka topi). 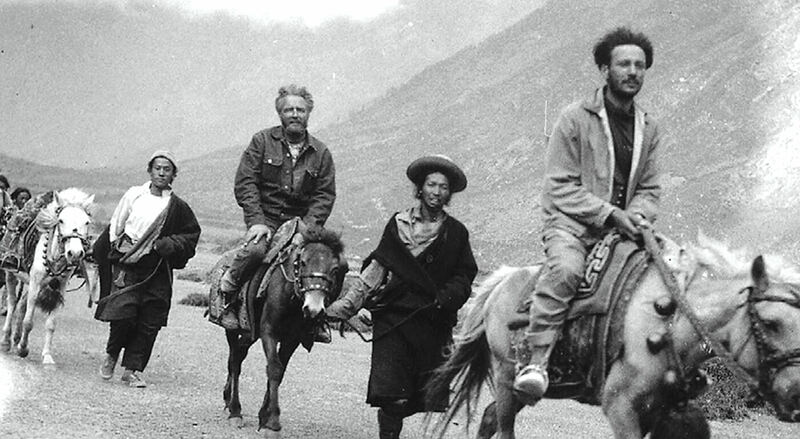 From left to right: Yam Gurung, the Rahul Brijnath, Devi Gurung, Ringo Starr, Wangdi, Mash Thapa. The shadows on the grass walls of the hide reflected the outlines of the Chitwan guests, anxious to catch a glimpse of the tiger’s powerful striped muscles in the jungle clearing below, lit by a rudimentary handheld battery spotlight. 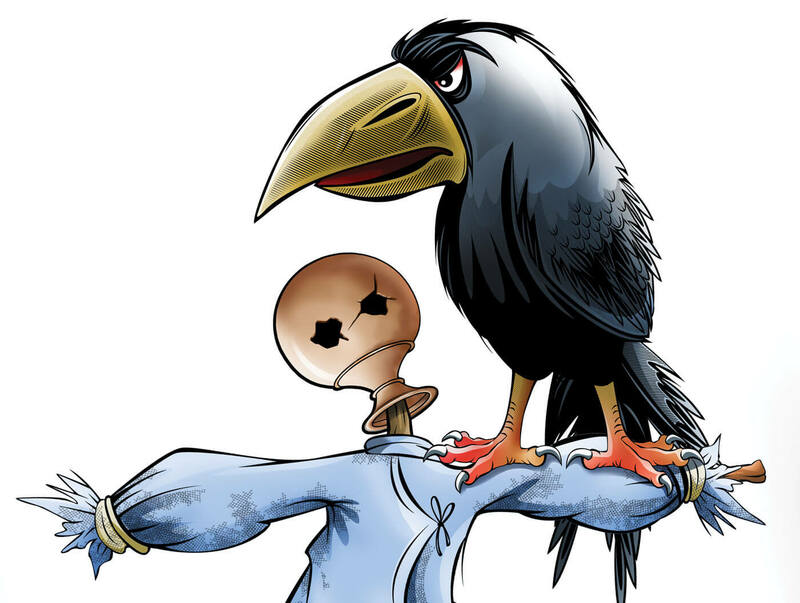 The silhouette of Harpo the Clown’s fuzzy hair, porkpie hat and bulbous nose struck an incongruous note in the dark silence of the jungle blind amongst the other clients, and Mash Thapa struggled to suppress his mirth and keep his hand steady. Mash was one of the elite band of highly skilled guides trained by Chuck McDougal who made the Tiger Tops experience so memorable and unique. With oodles of energy and a background in river running, Mash had been put in charge of looking after Harpo’s visit, a famous American Master Clown and veteran of Ringling Bros Barnum and Bailey Circus from Florida. 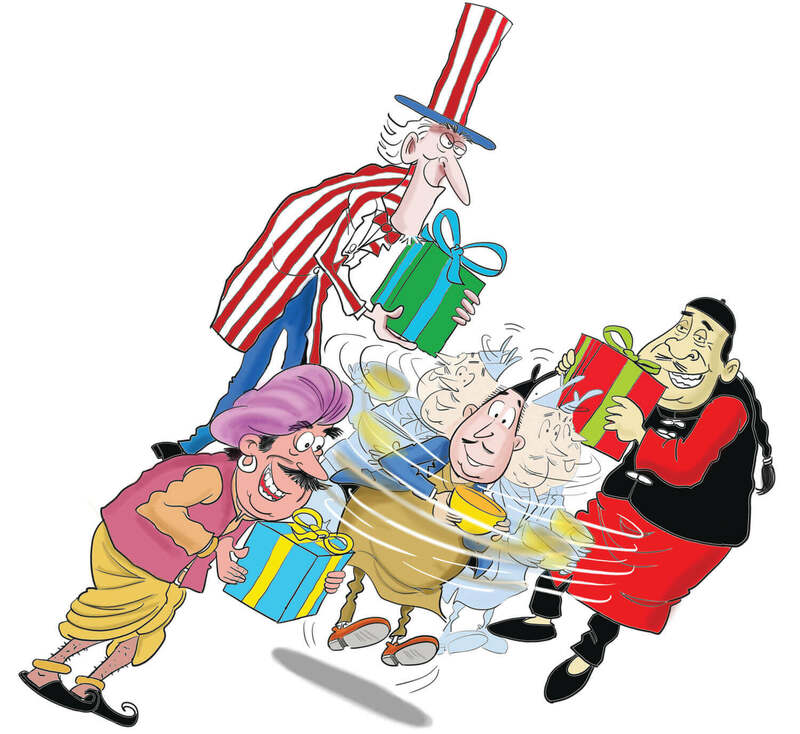 Celebrities and stars were not unusual in Nepal before the insurgency. Harpo communicated in the universal language of mime using no words. American Master Clown Harpo, of Ringling Bros Barnum and Bailey Circus from Florida, as he sets out on a game drive in one of Tiger Tops’ classic open land rovers in 1985. Mash Thapa standing in the back. The 1985 Meghauli school children were entranced by his balloon tricks and flat-footed antics. At the end of his wildlife safari, all the elephant mahouts were wearing Harpo’s multi-coloured personalised balloon hats. The naturalists usually came with a background in conservation and the outdoors, gravitating into our orbit from their homes all over Nepal and India, keen to make a career out of their passion or hobby. Their biodiversity expertise was imparted by Chuck, and their jungle skills moulded by his team of shikaris who spent a lifetime in the forest. The on-the-job training was systematic and rigorous, and the Tiger Tops naturalists acquired a knowledge skill set unmatched by other camps. In Chitwan and Bardia these young khaki-clad kids constituted the vital link between guests and the unfamiliar tiger terrain which surrounded them – dense sal and riverine forests, crocodile infested rivers and tall grasslands teeming with rhinos, deer and hundreds of species of birds. The naturalist’s role was to guide and interpret the flora and fauna on hikes, boat rides, jeep drives or elephant safaris, giving clients an unforgettable experience but bringing them back safely in one piece. And not just the big stuff – butterflies, beetles, dragonflies and termites were sometimes all that were encountered on an unlucky outing, and it was the naturalists’ task to tell the stories and bring the park alive. 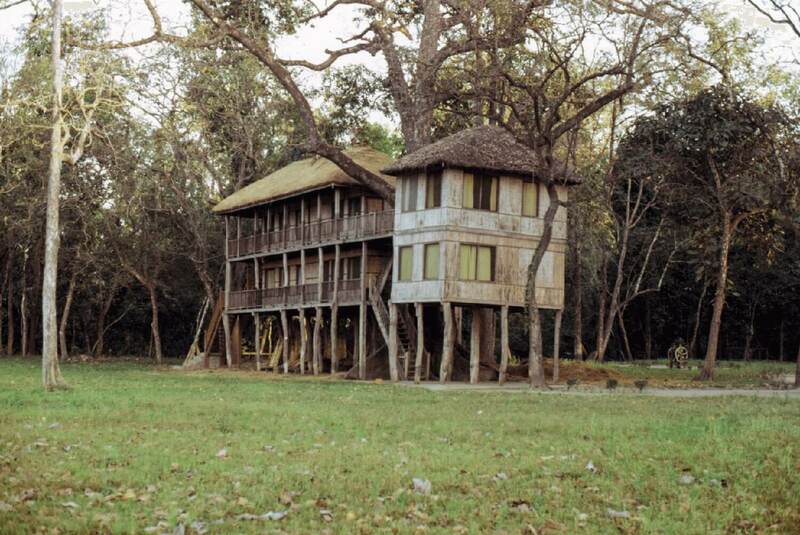 Tiger Tops Jungle Lodge in 1973 was a model for India on how to promote responsible wildlife tourism and conservation. Their work did not end when the sun went down. Within the military-style hierarchy of the Lodge, local staff ate in rotation in the elephant camp canteen and slept in quarters by the river. Naturalists and guest relations (such as me, at the time) stayed in rooms across the nullah but were expected to eat with the guests in the thatched rotunda, waiting until the circular tables of eight were filled, then slipping into an empty chair beside whoever looked the most interesting. Our mostly male macho naturalists were the mainstay of the wildlife operations, and some of them lasted for many years. 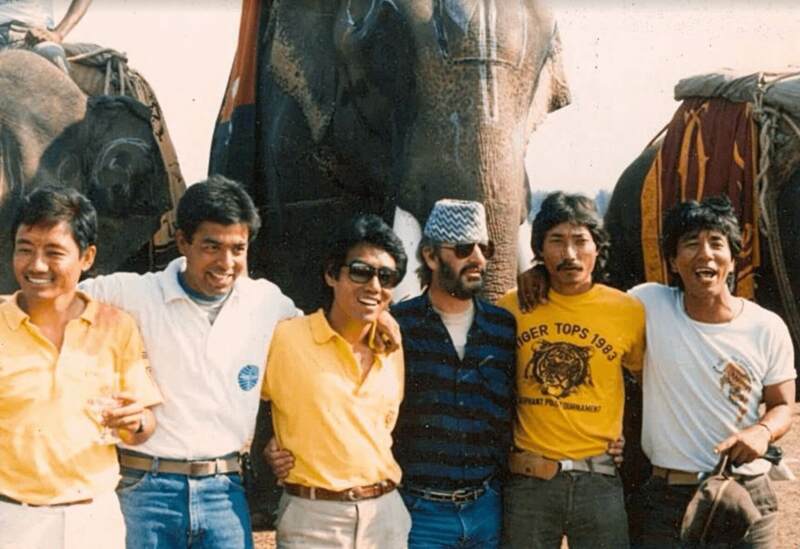 Their names echo down the decades, balancing with bravado behind the elephant howdahs, the high calibre cadre includes KK Gurung, Hashim Tyabji, Ashish Chandola, Manvijay Singh, Balaram Thapa, Devendra Basnet, Wangdi Gyamcho, Yam Gurung, Dinesh Thapa, Karan Rana, Devi Gurung, Suhail Gupta, Bhim Gurung, Dominique Ishmael, Pushpa Maskey, Kamal Rai, Surendra Rai, Mitra Paudel, Dhan Bahadur Tamang, Ramjan Chaudhary, Chandra Thapa, Dushyant Singh, Adam Barlow, John Roberts, Kalu Ram Tamang, Sukram Kumal, Pradeep Rana and more. Rahul now runs a global travel business with his English wife from their home in Devon. Others graduated away from tourism into conservation, academia, research or filmmaking. None will forget those years in the Nepal jungles which so strongly shaped their lives and careers. Over the years many jungle romances ended in tears but a surprising number blossomed into marriage, including my visiting sister who still lives in the wilds of India. The list of Tiger Tops’ liaisons is long but to name a few: Mash married Narece, Toby married Laxmi, Bhim married Sandhya, Adam married Cristina, Pushpa married Dominique, Nick married Beant, and Jeff married Christina. Jim Edwards, our big boss, used to proudly quote Prime Minister Indira Gandhi: “Why does India have to look to Nepal to see how to achieve responsible wildlife tourism?” That all changed in 2012 when the Nepal government closed the lease concessions for reasons that still remain unclear, in one blow removing the ability for Nepali operators to successfully deliver high quality wildlife attractions to high paying punters. Today thetables are turned and Indian national parks boast an impressive array of elegant lodges, tented camps, restored forts, palaces and havelis glamorously adapted for visitors, although Nepal still has the edge when it comes to walking safaris, effective protected area management and the control of poaching. The ultimate irony and loss for Nepal tourism is that many of these Indian boutique properties and wildlife operations celebrated throughout the subcontinent are today run by our very own naturalists who cut their teeth in the incomparable jungles of Chitwan and Bardia.